Blame the NYC Bicycle Film Festival and the weather for keeping me from blogging regularly lately. Ironic, I know. A busy weekend full of bicycles and hats can do that to you, though. Saturday morning started with brunch before heading to NYC Velo [yet again] in the increasingly persistent rain. We hurried to the shop with heads down, attempting to shield our faces from droplets of water, to pick up a tent, a banner, and a box of goodies. An Ortlieb bag was packed with Gage & Desoto gear, my own Baileyworks stuffed with hats, some optimistic hopes crammed into our pockets, before the whole operation was carried to the street fair. Despite the flash flood warnings, even Jason K. [check out his pimp profile here] showed up with another Ortlieb's worth of t-shirts and flyers advertising the silk-screening classes he's offering. And with good company and plenty of bicycles, there wasn't much to complain about...well, other than the damp weather, of course. Wrapped up in a borrowed raincoat, I mentally cursed the weather as I watched the sky. 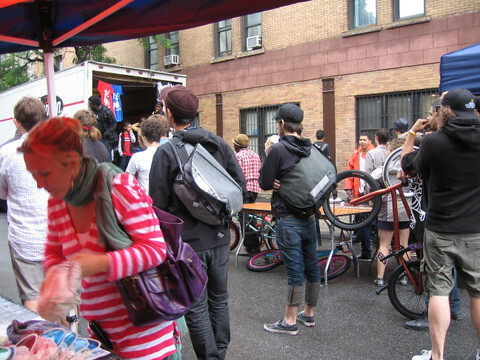 I seemed to be the only one, though, as BMXers happily did tricks up and down the street, slipping on the wet pavement. A crowd of people gathered to watch, and as the rain finally let up, the cluster of people eventually grew to a slightly surprising size. Or, maybe, it was only surprising to me. This is the BFF after all, and even in the rain people were showing up on bicycles, dripping wet but eager to have fun. 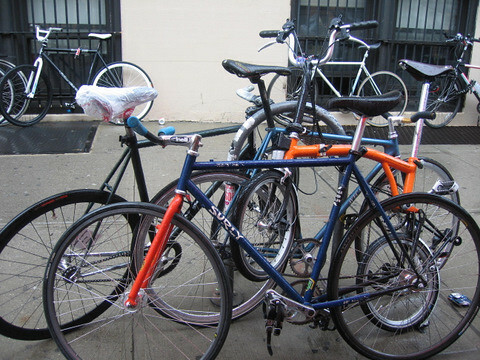 And this being NYC, there were cruisers, hybrids, track bikes, BMXs and all manner of bicycles. Sales weren't great, but the people watching was well worth the time spent under the blindingly orange tent. We folded up the operation a few hours later, caffeine withdrawal calling us back to NYC Velo, then Abraco [yes, I'm an addict]. Later, fish were gutted, dinner cooked, more ideas bounced around before face-planting on my sister's couch, exhausted and braindead. But not before the weather forecast for Boston was checked. It says rain. All week. I'm trying to stay optimistic, though.